Apr 26, 2013 KUALA LUMPUR PAS spiritual adviser Nik Aziz Nik Mat today launched a Pakatan Rakyat campaign pamphlet carrying an open letter from prominent international Sunni cleric Yusuf Qaradawi, endorsing opposition leader Anwar Ibrahim as candidate for prime minister. Nik Aziz (in white robe) launched the pamphlet at the Pantai Permai people’s housing project in Lembah Pantai, Kuala Lumpur. Accompanying him was PKR’s Lembah Pantai incumbent Nurul Izzah Anwar, who is facing a tough battle to defend her seat against her challenger from BN, caretaker Federal Territories and Urban Well-being Minister Raja Nong Chik Zainal Abidin. Nik Aziz’s launch of the letter in the heart of the low-income Malay area is a clear attempt to shore up Malay Muslim support for the embattled giant-killer Nurul, who had wrested the seat from former minister Shahrizat Abdul Jalil in her maiden political appearance in GE12. The letter dated March 2 this year was addressed to the people of Malaysia. Qaradawi heads the International Union for Muslim Scholars, the highest body representing Islamic ulama worldwide. 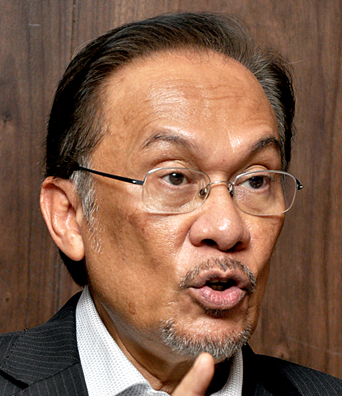 ‘I personally feel that Anwar, based on his history, experience, wisdom, struggle and perseverance from his youth till today, and the affection he commands from Malaysians, including the Malays and the Chinese, makes him qualified and most suited to head the government and hold the office of prime minister and lead the people of Malaysia,’ the Muslim scholar says in his letter. Australian media had reported earlier that Qaradawi had written a letter of support for Malaysian Prime Minister Najib Razak on the eve of his announcing the election. The Lebanese-based Al-Quds International Institution (AQII), closely tied to the Global Muslim Brotherhood, had praised Prime Minister Datuk Seri Najib Razak for his “continuous support of the Palestinian cause” and his visit to the Gaza strip in January.